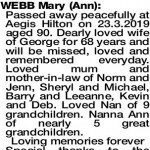 The Funeral Service for Mrs Ann (Mary) Webb of Palmyra will take place in our Chapel, 312 South Street, Hilton commencing at 2:00pm on TUESDAY (2.04.2019). 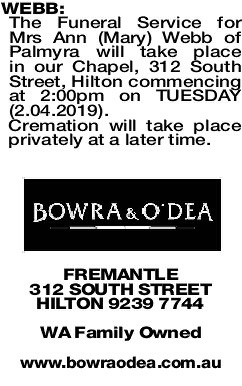 Passed away peacefully at Aegis Hilton on 23.3.2019 aged 90. Dearly loved wife of George for 68 years and will be missed, loved and remembered everyday. Loved mum and mother-in-law of Norm and Jenn, Sheryl and Michael, Barry and Leeanne, Kevin and Deb. Loved Nan of 9 grandchildren. Nanna Ann of nearly 5 great grandchildren. Loving memories forever Special thanks to the wonderful, caring staff at Aegis who have also been mum's family for 9 years. Our precious Mum, Nan and Nanna Ann. You were one of a kind and a truly beautiful lady with a big heart. We will hold your love, laughter and memories close to our hearts and will miss you everyday. She was here. She was loved. Her life made a difference. Your determination, wisdom, unconditional love and strength will always inspire us. Our beautiful Mum, Nan and Nanna Ann. Thank you for the unconditional love, support and guidance you gave to all of us. Every moment we ever shared with you and the memories we created together will be held close and cherished forever. Loving sister of Thel (dec) and Griff (dec). Beautiful Tante Ann to her Griffiths nieces and nephews. Wonderful memories to treasure forever. 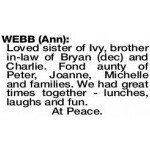 Loved sister of Ivy, brother in-law of Bryan (dec) and Charlie. Fond aunty of Peter, Joanne, Michelle and families. We had great times together - lunches, laughs and fun. 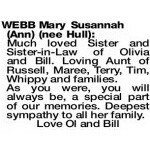 Much loved Sister and Sister-in-Law of Olivia and Bill. Loving Aunt of Russell, Maree, Terry, Tim, Whippy and families. As you were, you will always be, a special part of our memories. Deepest sympathy to all her family. 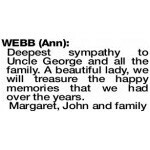 Deepest sympathy to Uncle George and all the family. A beautiful lady, we will treasure the happy memories that we had over the years. You will stay always in our hearts because you were and are loved truly by all of us. Deepest sympathy to George and all the families. 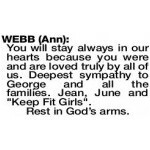 Jean, June and "Keep Fit Girls". 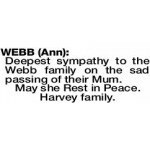 Deepest sympathy to the Webb family on the sad passing of their Mum.